Buy Cheap Umarex Tac TDP45 Airgun | ReplicaAirguns.ca | Easter Weekend Sale! 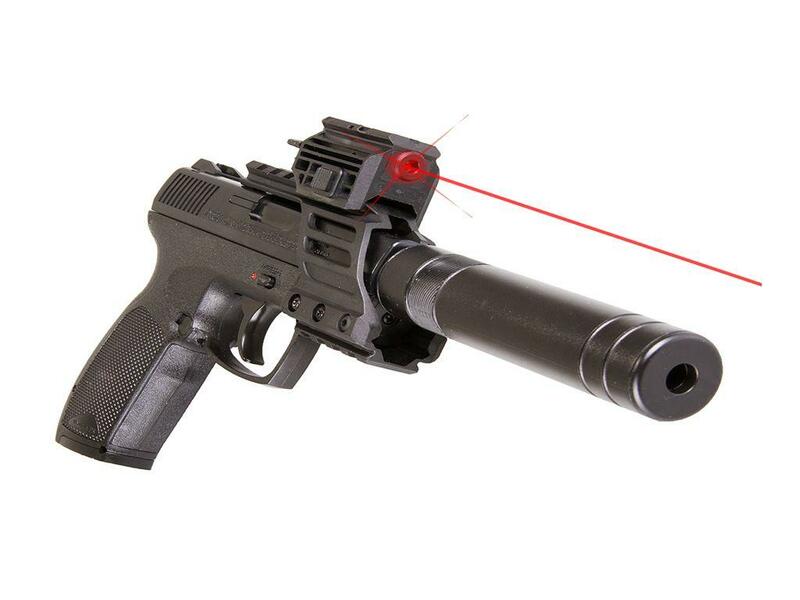 Trigger Pull: The trigger pull on the Umarex and TDP 45 TAC is medium to heavy but since it is a double action only trigger, this is to be expected. There is a fair amount of take up with the entire pull being about 8-9 pounds with the release point happening right at the very back of the pull, you get a bit of a clicking sound warning right before it releases. If you are used to shooting other lower priced double action triggers where the barrel protrudes out of the front of the gun when you pull the trigger then you will know what to expect with this this style of DOA trigger as the setup is pretty much exactly the same. Accuracy: Since the TDP 45 TAC comes with a laser, I opted to use the laser over the open sights even though you have the choice of using open sights as there is an open channel under the sight rail allowing you to see both the rear and front sight pretty clearly. Of course you can mount a scope or red dot sight on the sight rail if you choose to. During my Field Test Shooting portion of this review I would have to say I got around a 2 inch 8 shot grouping but considering I actually took 10 shots, the extra 2 shots spread the grouping out a bit to around 4-5 inches. I do have to recommend you keep a close eye on the laser battery door as mine had a tendency to open up mid shooting. Perhaps some black tape is in order? In terms of FPS performance, my Umarex TDP 45 TAC shot really close the claimed 410 fps coming in at 397 with my 5 shot chronograph testing using a brand new CO2. You can expect to get higher feet per second performance on a warmer day since temperatures on my test day where not overly warm. Realism: The TDP 45 TAC CO2 BB Pistol is not actual replicas of any specific gun in production that I know of, it is styled after today’s modern mid to compact sized semi auto pistols but it is hard to pinpoint any one specific gun. 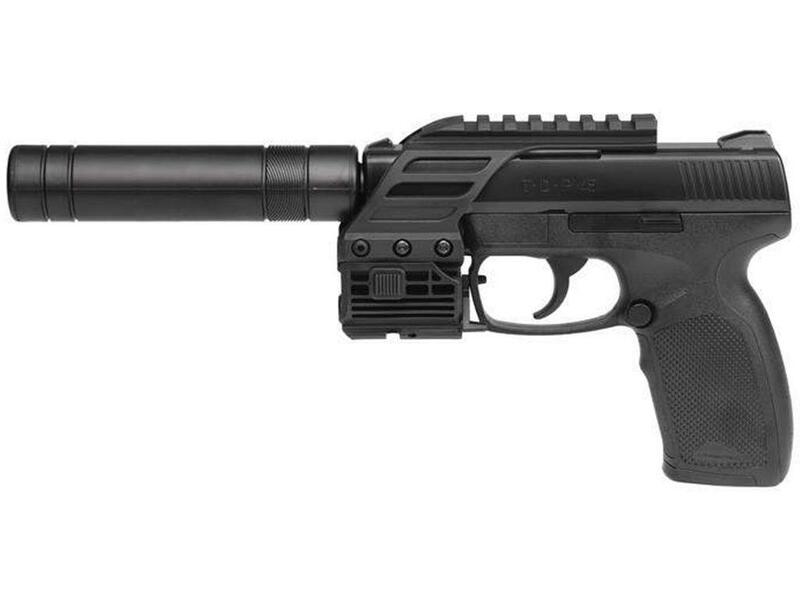 The TDP TAC 45 does look like a real gun but it's function is based more around what the easiest way is to build a BB gun rather than how can we make this gun function as close to a real gun as possible. That said it is very efficient and simple in operation which should make it very reliable in the long run. Very low cost, at $60. Nice combination of lots of shots per CO2 with strong FPS and overall decent accuracy. Universal metal stick magazine works in a variety of guns, can mix and match. CO2 tab is fairly well hidden. 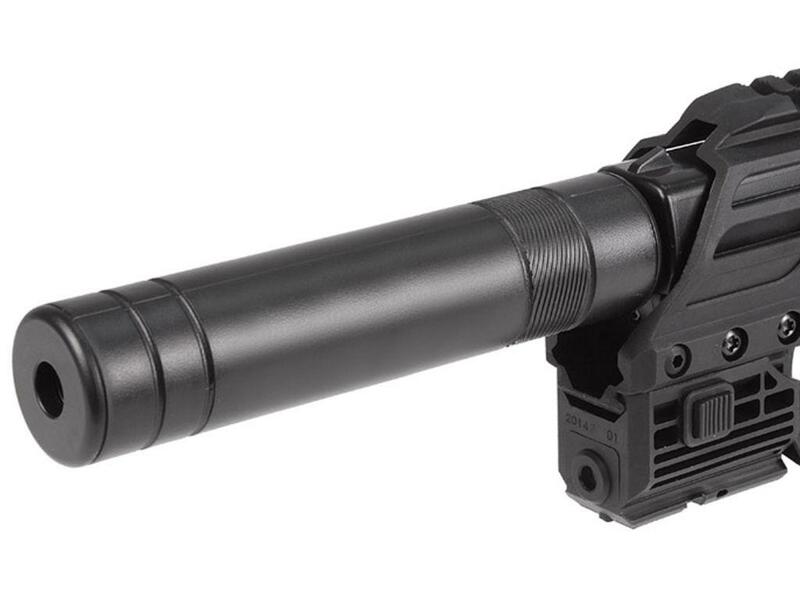 Comes with sight rail, laser and mock suppressor accessories, some could even be sued on other guns? Construction screws are less obvious (Smaller and discrete). Tried and true firing mechanism that works and is reliable. I like the SA177 style CO2 hatch that opens and pivots. Double action trigger is a bit long and heavy which can affect accuracy. Battery cover on my laser could be tighter and less likely to open up accidentally. For $60 you get a lot of fun and versatility for what you are spending. You could even take some of the Tactical accessories off like the sight rail and laser and sue them on some of your other air pistols with rails. No the Umarex TDP 45 TAC is not the most realistic or highest quality airgun out there but I bet you will get tired of shooting it before it wears out on you because it has such a simple internal firing mechanism. You can change the look by either taking some of the accessories off or adding even more, the choice is up to you! 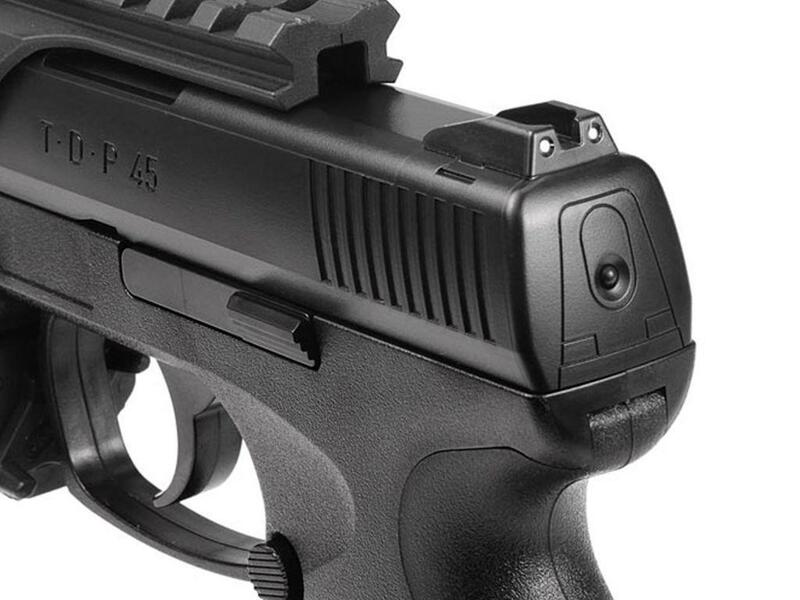 http://www.ReplicaAirguns.com - Umarex TDP 45 TAC CO2 BB Pistol Table Top Review. This video is a walkthrough review of the Umarex TDP 45 Non-blowback CO2 BB Pistols. I show off this airgun close up from all angles and point out the mostly plastic external construction and go through the features and benefits of this low cost but very versatile BB pistols. The TDP 45 TAC CO2 BB Pistol is not actual replicas of any specific gun in production that I know of, it is styled after todays modern mid to compact sized semi auto pistols but it is hard to pinpoint any one specific gun. 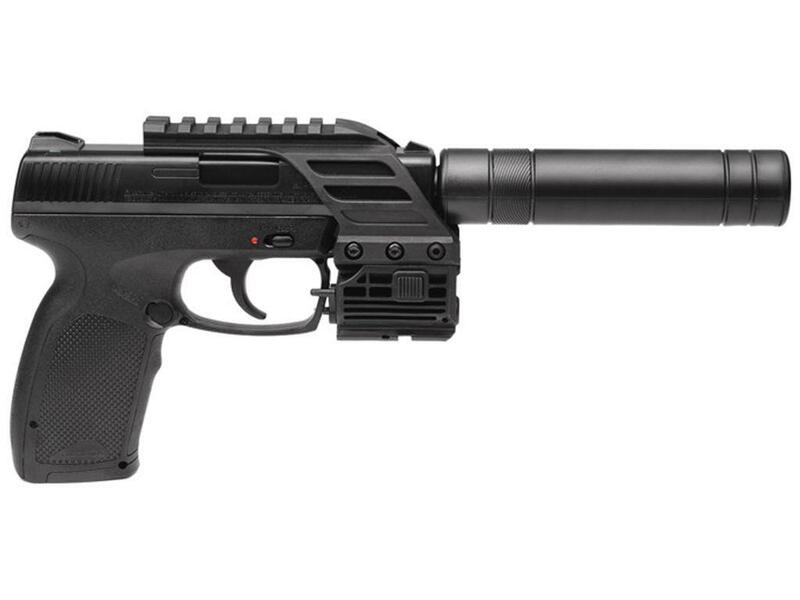 The TDP TAC 45 does look like a real gun but it's function is based more around what the easiest way is to build a BB gun rather than how can we make this gun function as close to a real gun as possible. That said it is very efficient and simple in operation which should make it very reliable in the long run.